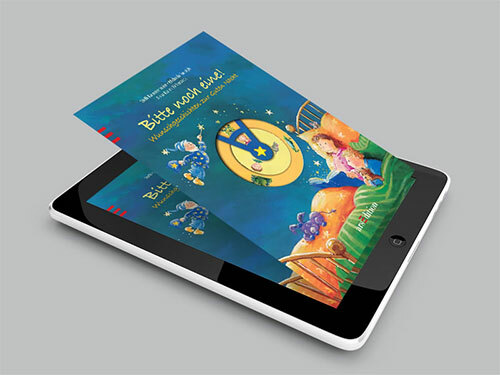 WITS Interactive created an ePub for Ars Edition the publishers of 'Bitte noch eine' through our German client Terzio. The interactive ePub showcased amazing features which made the reading experience fun. "Bitte noch eine" is a bed time story book which was converted into an ePub. We incorporated several features making reading pleasurable. We created an interactive page which had 13 characters and any combination consisting of 4 characters would take you to another story. That was something quite interesting. Isn't it? It's a very rare feature which creates a very engaging effect and through this feature you can have access to 108 combinations and stories to read. The functionality of Read aloud was also created which made it even more interesting. On the whole it is quite credible as well as an exceptional ePub for children. The concept of converting a simple book into an interactive and engaging ePub helps children to drum into the habit of reading and it was a productive effort by Team Wits in terms of usability and uniqueness!